The Euro Area unemployment rate was 8.5% in April 2018, down from 8.6% in March 2018 and from 9.2% in April 2017. This is the lowest since December 2008 but still more than double of the US unemployment rate of 3.9% reported in April (the US unemployment rate further fell to 3.8% in May). 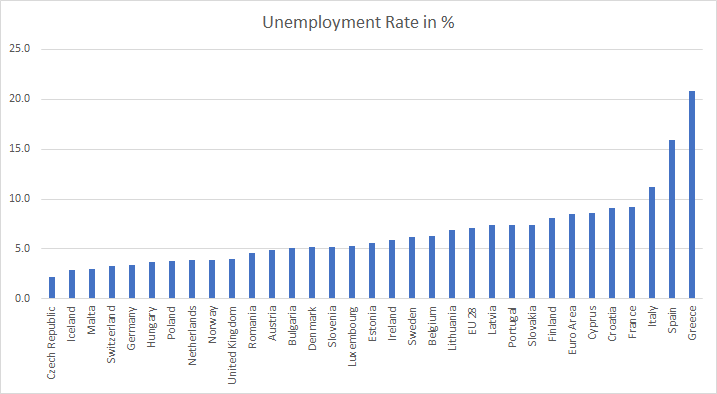 The EU28 unemployment rate was 7.1% in April 2018, stable compared with March 2018 and down from 7.8% in April 2017. This remains the lowest rate recorded in the EU28 since September 2008. We have been analysing some numbers from the latest releases from Eurostat (the official statistical office of the European Union), the International Monetary Fund, the Federal Reserve, the European Central Bank, the Bank of England and the Bank of Japan. We will be posting several findings in the next couple of days. 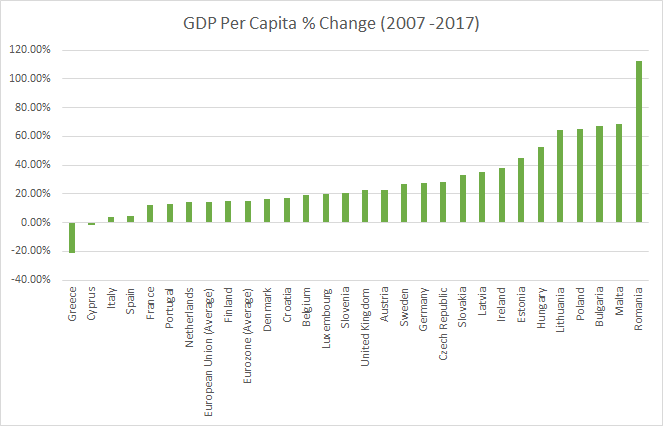 We begin with GDP per capita between 2007 and 2017 for countries which are part of the European Union based on a statistical release from the Eurostat.